What is Mindfulness? We hear it spoken of more and more regularly. Indeed it has become something of a “buzzword” in recent years. But what does it actually mean and what are the real benefits, if any, that it can bring? A sense of awareness of the present moment lies at the heart of what it means to cultivate mindfulness. 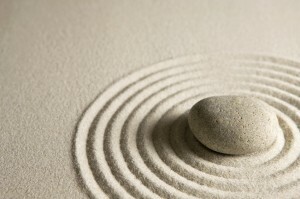 Jon Kabat-Zinn, the prime exponent of mindfulness in Western medical and psychological settings, defines it as follows: “Mindfulness means paying attention in a particular way: on purpose, in the present moment and non-judgementally.” In other words it is about getting a handle on your “thinking mind”. If we can bring some more perspicacity to each moment we can begin to see the processes that occur within us at any given time. We can see the subtle sensations, thoughts and feelings that lie behind our actions and motivate our behaviour. We can begin to choose how we react to the stimuli around us, and even influence our habitual moods and emotional states. At the very least we can begin to develop an attitude of kindness towards ourselves, and others, in our moment-to-moment experience. How do we actually do it? Mindfulness is generally thought to originate in Eastern spiritual traditions but also has flowered in various Western contexts. However, it has only become widespread in the West in the latter part of the 20th Century. With all this history behind it there are many techniques available but to begin with it’s about bringing the mind under control. Not by forcing anything or shutting anything out, but by developing the ability to maintain attention on the object of meditation. Commonly the breath is used as a focus, or “anchor” to the present moment, because it is always available and brings us into contact with our bodily sensory field. By simply paying attention to the sensations we experience with each breath – in and out – we are able to shift attention away from our thoughts and develop stability of awareness. Following this simple practice can reveal quite how powerful and insistent the mind’s thinking processes are! When I sit down and meditate I find a tendency for my thoughts to focus again and again on different ideas and plans for the future – from anything as banal as the shopping list to an exciting creative project. It has been very helpful to discover that, with practice, I can relinquish the planning and settle into the present moment. For although the planning is helpful and necessary in moderation, it often undermines my actual enjoyment of what’s going on right now as I’m too busy planning the next thing! In this small way Mindfulness can help with the majority of psychological difficulties we face. Habitual emotional states that are causing distress, such as anxiety, anger or depression, can be altered through creating this space around the emotional experience and gaining the ability to intervene in negative cycles of thought. With the awareness of what’s happening inside we get to identify what we’re feeling and respond appropriately instead of acting unconsciously and doing what we’ve always done. In this way it can be very helpful with compulsive behaviours such as addictions and eating disorders. It can be argued that a great deal of psychological suffering is exacerbated by the avoidance of uncomfortable emotion. Perhaps more importantly than any other benefit, Mindfulness enables us to “be” with our experience and develop the equanimity to move through and beyond turbulent waters. This entry was posted in Blog and tagged Bristol, Jon Kabat Zinn by freddy. Bookmark the permalink.